Since its introduction nearly eight years ago, tens of thousands of people have discovered their personal protocol for optimal health with the Whole30® program and experienced life-changing results. Using the book “It Starts With Food®” as your tool, you too can set off on a Whole30® journey to explore the way the food you put in your mouth affects you. Founders of Whole30®Program, Dallas and Melissa Hartwig, advise that food either makes you more or less healthy; their program requires elimination of foods that fall into the latter category. 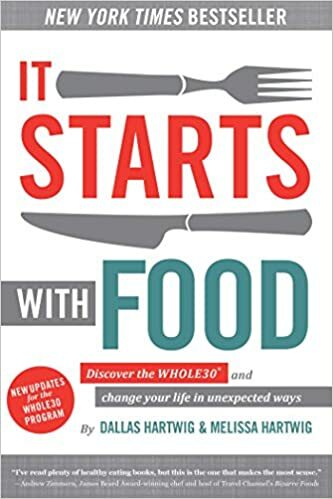 In "It Starts With Food®," the Hartwigs describe the intimate (yet overlooked) relationship between food and overall health—focusing on hormones, the gut, and immune system function. Their book lists, explains and rationalizes which foods support these key parameters of health and which do not. To do Whole30®, you must remove foods that fail to support hormonal, gut, and immune health—such as alcohol, vegetable oils, grains and dairy—for a total of 30 days. You are then encouraged to add back the foods you’ve been missing, one by one, to feel how each affects you. Because a one-size-fits-all approach to diet has historically proven unsuccessful, the Whole30® program instead inspires people to self-discover what works best for them. If, on day thirty-one, you eat a bagel for breakfast and feel overwhelmingly lousy (not to mention bloated), then perhaps you’re better off living a life without grains. A point of contention with the Whole30® program is the recommendation to enjoy healthy fats. Its guidelines support consumption of fats that are unprocessed, anti-inflammatory and not readily susceptible to oxidation (i.e., going rancid), which includes those from grass-fed and pastured animals (e.g., butter, lard, ghee), and oils from whole foods (e.g., avocados, olives, coconuts, macadamia nuts). While the idea of eating the fatty part of your steak or butterfat from grass-fed animals has many people flabbergasted, numerous individuals worldwide—fed up with unsuccessful attempts at low-fat dieting—have remarkably improved their health by fulfilling a Whole30®. One explanation for the overwhelming success seen with Whole30® is that it simply demands consumption of real foods and eliminates “Frankenfoods,” which have been designed to fool your senses. For example, when fat is removed from a food, extra sugar must be pumped in to mask the lack of flavor; consequently, you’re left with an immediate sugar rush and repeat hunger within a couple hours of eating. On the other hand, when eating foods naturally high in fat or adding healthy oils to your meals, you’ll find yourself more satisfied and for longer. This might explain why adding healthy fats to a morning coffee has gained so much hype—people are energized longer and, in some cases, happily cruise into the afternoon before ever feeling hungry. Beyond enhancing energy levels, fats make up the membranes that surround each of your cells and are critical for proper neural development. Fats are also key in absorbing essential vitamins (e.g., D, K2), which is why healthy oils should accompany salads and veggies. Consumption of healthy fats can also increase levels of HDL, which many believe is even more important to heart health than lowering levels of LDL or total cholesterol. In addition, it is consumption of sugars and processed carbohydrates that increase triglycerides, not healthy fat. To successfully complete a Whole30®, it is imperative not to restrict yourself from healthy fats. When navigating your shopping list, be sure to include butter’s dairy-free cousin, grass-fed organic ghee. Ghee is a great paleo butter substitute. It is casein free butter that has been separated from its dairy constituents (i.e., clarified butter) through heating; it can replace butter in any recipe and is a premium paleo friendly oil. When it comes to real food and healthy fats, don’t be afraid to enjoy things the way they’re intended—naturally. In 2018, we sponsored Jenny Meadows, a new Whole30® Coach to attend the first annual Whole30® Coach Summit. The Summit is an opportunity for Whole30® Coaches to connect with each other, learn from experts in their field, and leave with a better understanding of how to serve the Whole30® community, their clients, and Whole30® Approved partners in their practice. As a coach sponsor, we cover their travel expenses so the coach is able to attend the Summit. My name is Jenny Meadows and I am a newly certified Whole30® Coach. I had the amazing opportunity to be sponsored by Pure Indian Foods to go to the Whole30® coaching summit this summer, and would’t have had the opportunity to join if it weren’t for these amazing people. I learned so much at this summit about how to be a better coach, and had the opportunity to meet some amazing people apart of the Whole30® community. Back home, I have been serving a particular community in Charlotte, NC for 6 years now through a non profit my husband and I run. I started a health initiative about a year ago which provides cooking classes, nutrition education and so much more. So many people in my community are lacking the necessary skills and education to meet a need so many of us have been provided with and that is health. When I realized this, I knew I had to take what I knew about health and give it away. As a Whole30 coach, I can now create sponsorship opportunities with individuals outside of our community, so that I can provide the people I love most with nutrition skills and education. Looking for healthy Whole30-friendly recipes? We have created many how-to recipe videos for everything from a quick and simple paleo breakfast to nutritious holiday sweet potatoes for the whole family to enjoy! All of the ingredients are included in the descriptions to make your shopping and cooking experience as simple as possible. Don’t hesitate to get creative—swap out veggies for what you have on hand! Atticus enjoying PRIMALFAT® Coconut Ghee.